1. 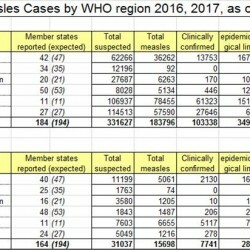 “Measles cases hit record high in the European Region”, has warned the WHO on 20 August 2018 – more information here : http://bit.ly/2BGzOGU. 2. Canadians travelling to Europe are invited to consult the travel health notice at : bit.ly/2wkr17s. Questions, comments and suggestions regarding this debrief are most welcome and can be sent to Sheikh.Qadar@umanitoba.ca. What are important characteristics of Measles? 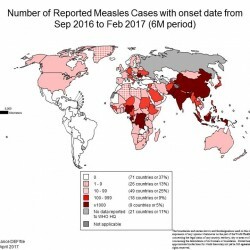 What is happening with current outbreaks of Measles? What is the current risk for Canadians from Measles? What measures should be taken for a suspected Measles case or contact? A single-stranded enveloped RNA virus causes measles, which is a member of the genus Morbillivirus that belongs to the family of Paramyxoviridae. It is considered a highly contagious viral infection. Symptoms begin 7-18 days after the first exposure and the incubation period runs between 7-21 days. Usually, clinical symptoms include high fever, cough, runny nose, red eyes, sleepiness, irritability and small white spots appear inside the mouth and throat. This is followed by a rash that spreads from head to toe within three days. The rash lasts for five to six days, and then fades. A patient is considered contagious from 4 days before to 4 days after the rash appears. Individuals with compromised immunity may not develop the rash; however, measles is more likely to lead to complications in infants and immunocompromised people. Common complications include otitis media, bronchopneumonia, laryngotracheobronchitis, and diarrhea. Serious complications reported include blindness, encephalitis (an infection that causes brain swelling) as well as severe diarrhea and related dehydration, ear infections or severe respiratory infections such as pneumonia. According to PHAC, complications such as otitis media and pneumonia occur in about 6 to 7 per cent of cases. According to CDC-USA, 1 or 2 of every 1,000 children infected with measles dies from respiratory and neurological brain damage complications. Subacute sclerosing panencephalitis (SSPE) is a rare but fatal degenerative disease of the CNS, characterized by behavioral and intellectual deterioration and seizures that generally develop 7-10 years after measles infection. Populations at risk for these severe complications include infants and children under 5 years, adults more than 20 years old, pregnant women who get infected and immunocompromised individuals. As per WHO recommendations, unvaccinated pregnant women and young children, and any non-immune person, are at risk of developing measles and its complications. Measles is still prevalent throughout the world especially in many developing nations, including different parts of Africa and Asia. According to WHO, measles is a leading cause of vaccine-preventable deaths in children worldwide. The majority (more than 95%) of measles deaths occur in countries with low per capita incomes and weak health infrastructures. Since the introduction of the measles vaccine in 1963-1964, measles cases have declined markedly. Before 1963, 300,000 to 400,000 cases were reported annually in Canada. In the year 1992, Canada set a goal for measles elimination by 2005 and in 1998; Canada achieved measles elimination due to great progress in 1990’s. Between 1996 – 1997, every Canadian province and territory added a second dose of measles-containing vaccine to its routine immunization schedule. Nevertheless, imported cases of measles continue to be reported. According to PHAC, between 1998 and 2013 about 134 imported measles cases were reported, with a range from 3 importations in 2005 to 29 importations in 2011. 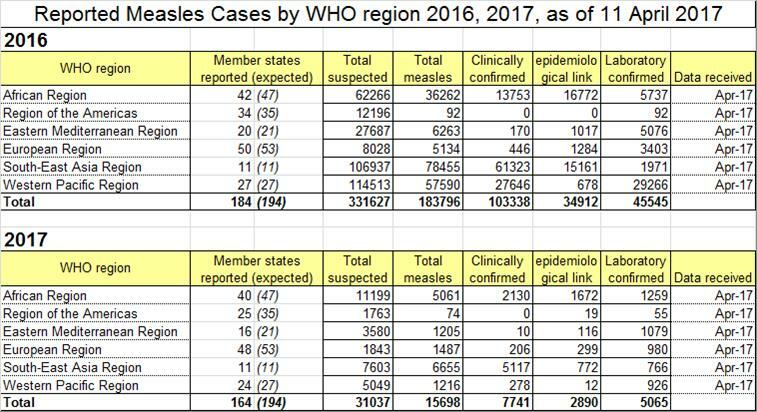 In 2015 and 2016, the total number of reported cases of measles were 196 and 11, respectively. Up to date 2017 statistics can be found under Question #2. Measles incubation is around 10 days (ranging from 7-18 days). The rash can appear between 14-21 days after exposure. The reservoir for measles virus is humans. Measles is a highly communicable infectious disease with more than 90% secondary attack rates in susceptible persons. The virus is transmitted by direct contact with infectious droplets (nasal or throat secretions) or by airborne spread when an infected person breathes, coughs or sneezes. However, it can be transmitted by an infected person from 4 days prior to the onset of the rash to 4 days after the rash erupts. The virus can remain infectious in the air for up to two hours. Even when index cases are no longer present, transmission in healthcare settings can occur due to persistence of the virus in the air or on environmental surfaces. According to PHAC, laboratory diagnosis of measles is performed by immediately collecting specimens for serology testing and virus detection for laboratory confirmation. Measles specific IgM serology is the standard test of choice for routine diagnosis of measles. Presence of measles-specific IgM-class antibody is indicative of acute measles infection when rash was present and there is a history of exposure to measles through travel to an endemic area or an epidemiological link to a confirmed case. Measles virus isolates are important for surveillance purposes (molecular epidemiology) as well as for confirmatory purposes; therefore, collection of appropriate specimen for culture is recommended for all sporadic cases. The real-time polymerase chain reaction (RT-PCR) assay is the most reliable test for the definitive diagnosis of measles infection. Measles virus isolation is also a very specific test when confirmed by immunofluorescence or RT-PCR. Measles IgM antibodies appear around the time of rash onset and persist for at least 28 days. IgG antibodies appear around the same time as IgM antibodies. The specimen collection timing plays an important role in laboratory interpretation. Samples drawn before 3 days after the rash onset are more likely to test falsely. Measles-specific IgM antibody and measles RNA detection by RT-PCR are the most common methods for measles confirmation. Genotyping can help to link or unlink cases and can suggest for imported cases. It is the only way to distinguish between wild-type virus infection and a rash caused by a recent measles vaccination. Measles is a vaccine preventable illness. PHAC recommends a combined measles, mumps, and rubella (MMR) vaccine to all children between 12- 15 months. A second dose is administered at either 18 months or between 4-6 years of age. Suspected measles case should be reported as soon as possible through local public health administration. According to CDC-USA, immunocompromised patients, pregnant women without evidence of measles immunity, individuals at risk for severe illness and complications from measles like infants younger than 12 months of age should receive Immunoglobulin (IG). However, they should not be used to control measles outbreaks but rather to reduce it. There is no specific treatment available for measles virus and it affects all age groups. Symptomatic care is usually offered to relieve symptoms and antibiotic is prescribed to treat bacterial infections like pneumonia, eye and ear infections. According to WHO, Vitamin A supplements have been shown to reduce the number of deaths from measles by 50% due to this reason it is recommended to administer two doses of vitamin A supplements given 24 hours apart to all children diagnosed with measles from developing countries. This restores low vitamin A levels during measles that occur even in well-nourished children and can help prevent eye damage and blindness. As of April 10, 2017, 26 cases of measles have been reported in Canada. As per the Canadian Measles/Rubella Surveillance System (CMRSS) and the Measles, and Rubella Surveillance system (MARS), there was one confirmed case of measles reported in week four of 2017, followed by two cases in week 6, and one case in the seventh week of the year. A sharp increase was reported in week 8 with four reported cases, then again in weeks 9 and 11, only one measles case was reported. In week 12 and 13 of 2017, six and 10 new measles cases were reported, which is the highest number so far. Nova Scotia currently has the highest number of cases with 11 active cases, followed by Ontario with six cases. According to PHAC, these cases are all linked to nine unique importation events. In 2017, measles is affecting Africa, Europe, Eastern Mediterranean and Western Pacific Region. African region has reported 2,260 total measles cases, European region 615, Eastern Mediterranean region 407 and Western Pacific Region had 495 total cases. According to CDC-USA, so far 28 measles cases have been reported in the USA in the year 2017. These individuals are from ten states (California, Colorado, Florida, Michigan, Nebraska, New Jersey, New York, Pennsylvania, Utah and Washington). In 2016, there were 70 cases. In 2015, there were 134200 measles deaths globally–about 367 deaths every day or 15 deaths every hour. As of March 3, 2017, Alberta Health services (AHS) has confirmed one case of measles. British Columbia Centre for Disease Control reported that in late February, two separate flights through Vancouver International Airport (YVR) had a measles infection on board. Three lab confirmed travel-related measles cases are reported in Toronto. In addition, a case was reported in Toronto District, Huron Street Junior Public School. Peel Public Health is also investigating a confirmed case of measles in a child from Mississauga. As of April 4, 2017, thirteen measles cases have been confirmed in the province of Nova Scotia. As per PHAC, all individuals who have not had measles infection or who have not been properly vaccinated are at higher risk for infections. In Canada, all adults born before 1970 are generally assumed to have acquired natural immunity, as there were high levels of measles circulating before that time. People who are at high risk to catch measles include students, healthcare workers, and travelers to destinations outside of the region of the Americas. CDC-USA recommends having a proper dose of MMR vaccine before international travel especially in many parts of the world where measles is still prevalent such as areas in Europe, Asia, the Pacific and Africa. 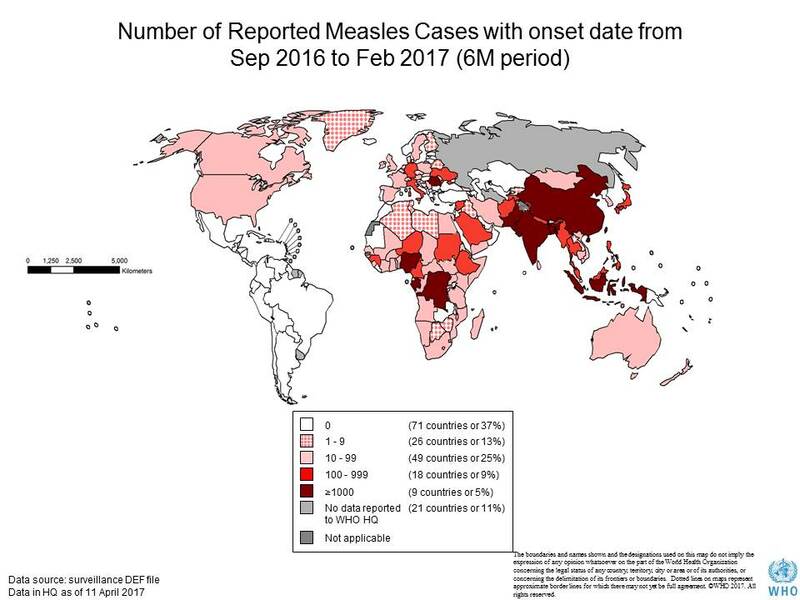 PHAC has reported that, in China alone, there were more than 42,000 cases of measles in 2015; in India that same year, the reported number of cases was 83,000. Measles is also endemic in countries like Mongolia, Pakistan, Nigeria and Sierra Leone. PHAC has laid out special detailed instruction for travelers including for air travel, marine travel on cruise ships and other travel modalities. PHAC has categorized infectious diseases around the world into four levels based on associated risk. Measles is categorized as level 1. PHAC recommends that public health authorities should be notified as soon as possible of measles cases. At present, a small fraction of the suspected and probable cases investigated are confirmed as measles. To provide appropriate intervention and to investigate the period of communicability it is essential to collect information about the case and those who may have been exposed. Essential components of case investigation include confirming the diagnosis, vaccination history, source of infection and the risk of transmission. According to PHAC, it is mandated that within 24 hours of reporting a suspected measles case it should be classified either as susceptible or non-susceptible. The immunization status of community contacts of cases should be ascertained to determine susceptibility to measles. As per PHAC requirements, any suspected measles case should be reported on an urgent basis through local public health networks. In order to prevent virus transmission, a patient should be isolated for four days after appearance of the rash. Please check with your province for reporting guidelines. PHAC has detailed instructions on infection prevention and control measures for suspected or confirmed measles cases in the guidance for the prevention and control of measles outbreaks in Canada.